It is not easy to find the Monkey Garden bar as it is located in the back of a hiking store. Once you’ve found it though, it is worth staying there for a drink. The place is tiny but somehow very atmospheric as they manage to get the best out of the space. 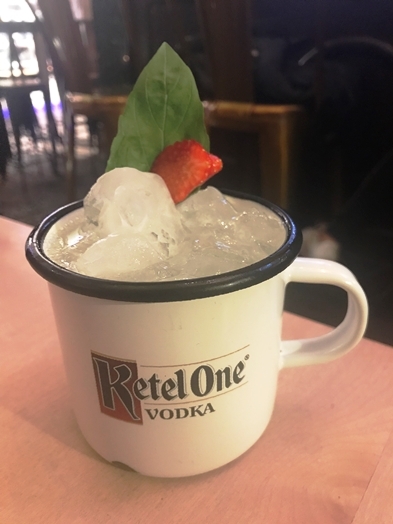 The service is also rather attentive and friendly – I decided to go for a “Blackforrest Mule with Monkey 47” (EUR 11.00). It was a bit confusing to get a gin-based drink served in a vodka labeled glass but the drink was actually good. Overall, the Monkey Garden Bar is kind of a hidden gem – if you don’t mind the noisiness of the Persian market next door. But the place is nice, the service is friendly and the drinks are fine as well.